Special Master Breeden with the checks for MVF’s third distribution. This chart shows the timing of the three major distributions of MVF during the past year. D1 was at 25%, D2 at 40%, and D3 at 56.65%. 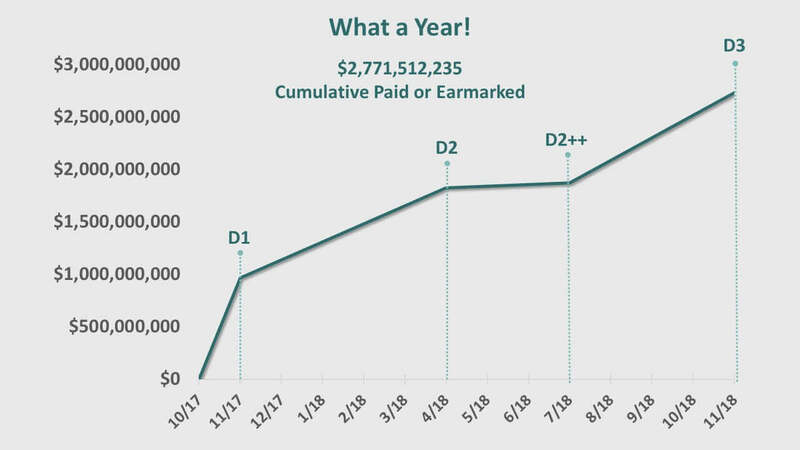 Two smaller distributions (D2++) in the summer of 2018 added newly-approved claims, but were carried out at the same 40% level as D2. The Madoff Victim Fund is pleased to announce that it has commenced a new distribution of more than $695.3 million in cash to 27,327 victims of the fraud involving the Bernard L. Madoff Investment Securities. There will also be $379.9 million earmarked to 9,684 additional victims. This is the third distribution of funds (“D3”) by MVF, which was created in 2013 to return funds forfeited to the United States Government to victims of the Madoff fraud. When D3 is completed in mid-December, MVF will have distributed or earmarked in excess of $2,771,500,000 to Madoff victims over a span of just 12 months. These funds have been distributed to victims of the fraud living in 49 States, the District of Columbia, and 121 other countries. In this distribution, $1,075,248,620 is being paid to or earmarked for 37,011 victims of the Madoff fraud whose petitions have been approved by the U.S. Department of Justice (the “Department”). This will bring all victims to a total recovery level of 56.65%, or an incremental payment of 16.65%. MVF will pay $695.3 million to 27,327 victims, and will earmark an additional $379.9 million for 9,684 victims. Of this amount, approximately $174.5 million will be paid to victims receiving payments for the first time. To date, 40,572 petitions have been approved by the Department. 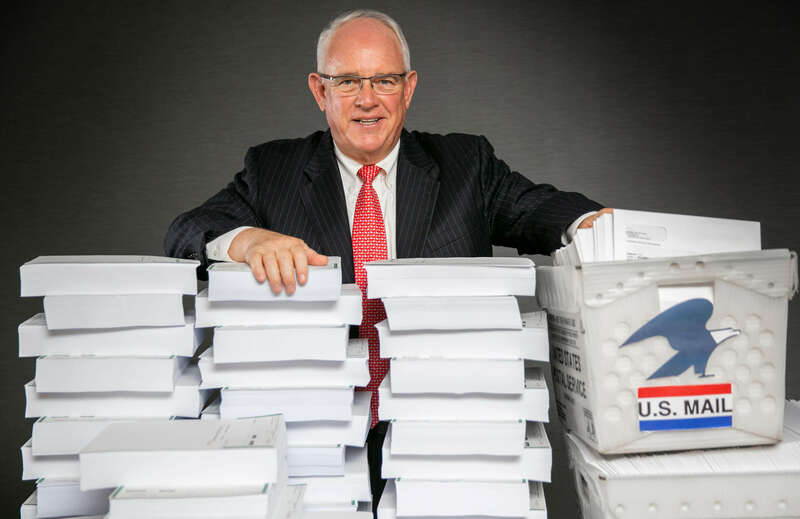 Of these, approximately 3,500 petitioners are not eligible to participate in the third distribution for various reasons, such as their collateral recoveries exceed 56.65% of their eligible losses or their payment would be less than $10. 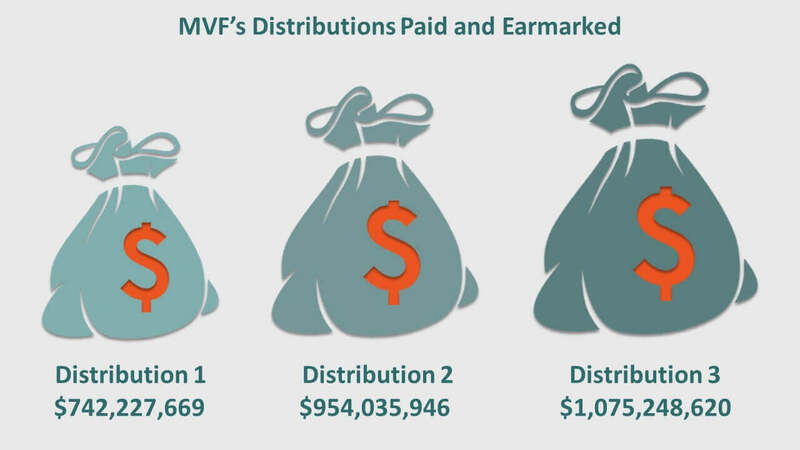 In MVF’s first two distributions, more than 29,000 victims received cash or earmarks of nearly $1.7 billion. This consisted of $1.275 billion in payments to more than 21,000 victims, and earmarks of an additional $423 million for 8,132 victims pending determination of their collateral recoveries. As a result of MVF’s first two distributions, victims were brought to a 40% recovery of fraud losses, including recoveries from all sources. As of the end of D3, MVF will have paid or earmarked more than $2,771,500,000 to 37,011 people around the world victimized in history’s worst financial fraud. 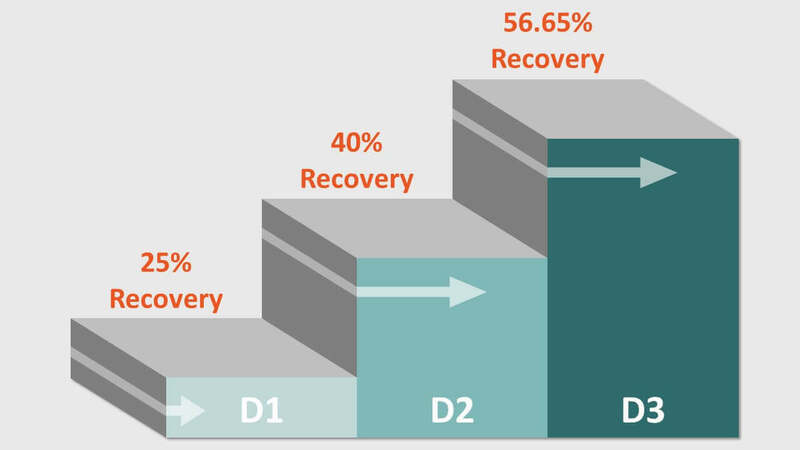 In accordance with MVF’s Plan of Distribution (the “Plan”) approved by the Department, each distribution is structured to provide progressively higher “baseline” percentage recoveries for all victims. One can think of these baselines like a staircase as illustrated below. In making payments to individual victims, MVF computes the amount that is necessary for each victim to achieve MVF’s baseline recovery percentage when all prior recoveries are included. In a sense, we provide a “rising tide” that lifts all victims up to the new recovery baseline, after taking into account all prior recoveries. With each higher baseline, victims who were at the prior level receive additional incremental recoveries. Victims who had collateral recoveries above the prior threshold begin receiving payouts when the recovery percentage surpasses their prior recoveries. For example, a victim with a $100,000 fraud loss and zero prior recoveries would have received $25,000 in MVF’s first distribution because the recovery baseline percentage was 25%. Another victim with a $100,000 fraud loss and $15,000 in prior recoveries would have received $10,000 to bring that victim to the same 25% recovery baseline. A third victim with a $100,000 loss and prior recoveries of $30,000 would not have participated in the first distribution because that person would have already recovered more than the 25% recovery baseline percentage. In MVF’s first payout, 21,592 victims were brought from zero or minimal recoveries to a 25% baseline recovery. In the second distribution, eligible victims were paid an incremental 15% distribution to bring them to a new baseline recovery of 40%. In the second payout, the first two victims would have each received an additional $15,000 to bring their combined total recoveries to the baseline recovery of 40%, while the third victim would have received $10,000 to reach the 40% baseline recovery. In this third distribution, MVF has now established a new recovery baseline of 56.65%, which represents an increase of 16.65% over the prior 40% baseline recovery. As a result, all three of the victims described above would be paid an additional $16,650. This same structure is followed for determining the amount of funds to be earmarked for victims whose payments are on hold pending additional recovery information. In each case, the victim’s payment is earmarked at the then-current recovery baseline with a zero collateral recovery. Once the victim’s collateral recoveries are determined, MVF will then pay the appropriate amount. Hopefully, this explains why MVF requires periodic updates of a victim’s collateral recovery amounts. As we have described before, this can be done by simply clicking the button shown below. Either provide us the amount of any new recoveries you have received, or certify under penalty of perjury that you have not received any recoveries that have not been disclosed. The process is very simple, and it makes the process fair for everyone. If you have not updated your collateral recoveries within the last six months, you should not expect to receive a D3 check. However, there is still time to certify, so please use the website to provide this information and maintain your eligibility for payments. Please remember, failing to update your recoveries makes your original petition – filed under penalty of perjury — incomplete. Falsely certifying that you have not received any additional collections if you have received outside recoveries would constitute a false statement under U.S. perjury laws and is a criminal offense. So, please be complete and accurate! Collateral recovery updates are essential. Please use the website to update your MVF records so your payments are not suspended. Simply click the button below to begin. Prior updates have briefly described our process of earmarking, or committing, funds to specific approved victims who are presently unable to determine their collateral recoveries. This situation arises with a fairly small number of investment vehicles that have recovered significant funds from the Madoff bankruptcy – often hundreds of millions of dollars – but not yet distributed these funds to their own underlying investors, who are also MVF claimants. In this small group of largely foreign investment vehicles, the redistribution of funds to investors has been blocked by litigation. There are also some other situations where the Madoff bankruptcy estate is still in litigation with an investment vehicle about the amount that the estate may owe, even though the bankruptcy estate acknowledges that some amount is due. As with the first situation, funds from the bankruptcy have not yet flowed through to the ultimate investors in these funds. Eventually these cases will be resolved through settlements or final judicial decisions. When that happens, the underlying investors in these vehicles are likely to receive significant distributions passed through from the bankruptcy. Until then, no one knows exactly what the underlying investors will eventually receive. Until the collateral recovery is known, any payment from MVF in these cases would likely result in an overpayment by MVF. As described above, MVF payments are calculated on the basis of aggregate returns from all sources. If MVF treats these investors as having zero recoveries, and large recoveries later occur, the result will be very sizable overpayments. As much as we want to pay every victim now, paying anyone more than they are entitled to under the Plan would reduce recoveries for all other victims. In the interim, MVF has determined the amount the approved victim would be paid with zero outside collateral recoveries. That amount is set aside, or earmarked, by MVF for the future benefit of that individual victim. Once the recoveries are known, MVF will pay the victim promptly. If the earmarked amount exceeds the eligible payment to the victim, the excess funds will be made available for additional payments to all victims. We must consider these future recoveries that are likely to occur when the litigation is resolved so that victims do not receive overpayments and other victims’ recoveries are not diminished. MVF has communicated with liquidators of several of these investment vehicles and their counsel to get a sense of the timeline and potential resolution of litigation in these cases. The net effect is that MVF has made actual payments of $1,968,679,289, and has an additional $802.8 million in earmarked funds. MVF and the Department are currently evaluating 1,149 Requests for Reconsideration (“RFR”) that involve an overall fraud loss amount of just over $1.532 billion. Each RFR receives a thorough and independent review to ensure full consideration of any new information. In addition, there are 1,818 claims involving fraud losses of over $1.722 billion that are pending a final recommendation and decision. As RFRs or pending claims are approved in the future, they will automatically be entitled to the same 56.65% payment, less collateral recoveries, that have been made to claims approved earlier. As a result, MVF must keep “payment reserves” that are sufficient to guarantee that we have the ability to make those payments. MVF estimates that bringing all these claims to a 56.65% level would require approximately $1.25 billion. 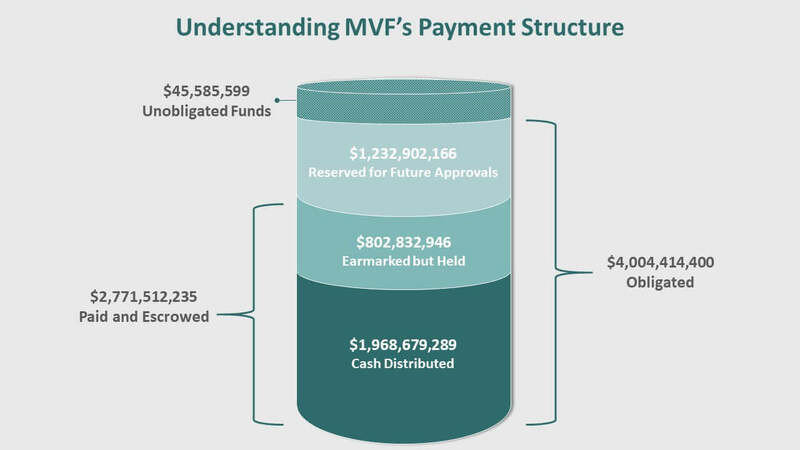 MVF refers to the sum of (i) cash payments; (ii) earmarked funds; and (iii) future payment reserves as its “Obligated Funds”. As the chart below demonstrates, MVF has now obligated just over $4 billion of the overall assets totaling $4.050 billion. We estimate that after D3 is complete, MVF will have unobligated funds of slightly over $45 million. MVF expects to make at least one more significant distribution to all victims in 2019. Since MVF’s assets are now nearly fully obligated, our ability to make future payments will depend on the timing and amount of final actions on all remaining pending claims, RFRs, and resolution of earmarked funds. This is the final phase of the overall distribution. Whenever a pending claim or RFR is approved in the future, the payment reserves will be used to make the approved payment to the victim. Any excess reserves revert to being unobligated, and available to fund an increased payout level for all victims. This works essentially the same for earmarked funds once those claims become payable. When RFRs are decided, the reserves for that claim are either paid to the victim, if the RFR is granted, or released back to MVF if the RFR is denied. The net effect of this process is that MVF’s current unobligated funds will likely grow in the coming months, and this will be the source for future MVF payments. During the coming year we will be working hard to resolve every open claim. This process will determine the amount of reserves that may be redirected to further payments to all eligible victims. I wish every one of you a very happy holiday season, and all of us at MVF send every best wish to you and your loved ones in the New Year. Click here to view the Press Release from the U.S. Department of Justice announcing the third MVF distribution. Learn about the extraordinary scope of history’s “biggest and most effective asset recovery effort” from the article Bernie Madoff at Last is a Good Investment, 10 Years Later courtesy of Fox Business. Have questions about your claim? We’re here to help. U.S. based support, Monday thru Friday, 8:30am to 5pm EST. The Madoff Victim Fund strives to reach all the victims of the Madoff fraud. Send us a note if you would like to share your views. “I’m writing to THANK each and everyone of you for the incredible work you’re doing to help us victims…we’ve been trying to get someone to understand that we, and people like us, were completely left out of the system. Our funds were stolen too, yet the only people that seemed to be cared about, and taken care of, is the BLMIS direct customers.” M.V. “I have just been informed about the approval of my claim through the Final Determination Notice you sent me. I want to express my gratitude to the team at Madoff Victim Fund, for the beautiful job they did and for their dedication and effectiveness accomplishing such a difficult task.” F.B. “I would like to thank all at the Madoff Victim Fund for all the time and energy put into this endeavor. I especially want to thank John. He has patiently assisted me on the phone on numerous occasions. He is kind and knowledgeable. He has made this difficult task a lot easier.” J.G. “I am very happy to learn that our petition has been approved. I wish to thank you, very much, for all your great efforts in helping us to recover at least some of our moneys. We really appreciate it. Thank you.” A.M.
© 2017 - RCB Fund Services, LLC. The RFS logo is the property of RCB Fund Services and may not be used or redistributed without permission.